Analysts say that the falling number of insolvencies and increase in business creation is a positive sign for the economy. 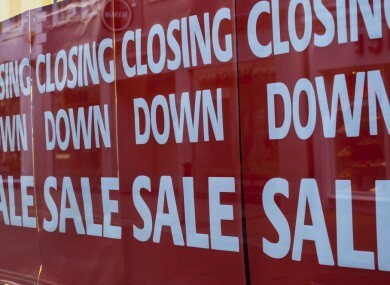 THE NUMBER OF companies declared insolvent fell by a third last month, but there were still 93 companies that went out of business. The figures come from business and credit-risk analysts Vision-net, who say that this months’ figures are down a third on September 2012′s. Of the 93 insolvent companies, 65 were liquidated, 21 entered receivership, and an examiner was appointed to seven. The five most volatile industries have remained the same this month with Professional Services, Construction, Wholesale & Retail, Manufacturing and Real Estate industries account for almost 75 per cent of insolvencies recorded so far this month. The number of consumer judgements awarded by Courts have remained the same (295 v 296) during September 2013 relative to September 2012, but the value of these debts has increased. In September 2012, the average consumer debt judgement was €63, 000 but in September 2013, this increased by an average of €40,000 to €103,000. Vision-net’s figures also recorded 2,777 company and business start-ups this quarter – up 3% on the same period in 2012 – showing an average of 126 start-ups per day. Of these, 1,708 were registered business names while 1,069 new companies were incorporated, up 17% on the same period last year. ‘‘Our data has shown consistent positive signs of business recovery over recent months, and this trend has continued in today’s data. The number of companies failing is reducing significantly and on the other side of the equation the number of new Irish companies now being created is also increasing. “However, the overall signs of growth in the economy remain overwhelmingly positive’, added Cullen. Email “Fewer Irish companies failing – report”. Feedback on “Fewer Irish companies failing – report”.